« Episode 15: Another Geekout with Blog Monkey Neo! Wear again? I hope so. Total Cost: Most of the materials I had on hand because I had originally purchased them for other projects. To make this new, it will cost from $5-$20 for materials, depending on if you are purchasing new fabric and if you are buying studs instead of using fabric paint. Someone had shared an article on Facebook quite some time ago that showed cats wearing classic punk denim jackets. 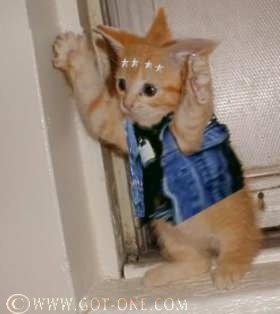 (http://www.buzzfeed.com/sbkasulke/look-at-these-19-adorable-cats-in-punk-vests) I shared the article and asked the general question of what punk jacket would be best to make for a cat and my friend Kevin said Vyv from the Young Ones. Thankfully, this show is much loved and there are many research options available for reference pictures as I did not see the Young Ones as I was growing up. Scandalous, I know. I watched Are You Being Served?, Mulberry Days, Monty Python’s Flying Circus, The Black Adder, Red Dwarf, All Creatures Great and Small, and Fawlty Towers. Oh, and Doctor Who. It was alway fun watching an episode of All Creatures Great and Small and then watching Doctor Who and going, ‘wait, didn’t I just see him?’ But I did not know about the Young Ones existence until much later. Anyway, this project presented many challenges. As I do not have easy access to a cat for pattern fittings, I had to guess on the sizing and shape for the best fit and cat comfort. My research shows most pet harnesses and jacket type items are kind of hourglass shaped and close in the back. The article shows jackets fitting the cats like they would on a person – closing in the front and pretty much a straight, somewhat boxy shape. Most of the measurements that I could find for cat jackets were somewhere around 16 inches long with a 9 inch neck/collar. So, I measured and I cut 17 inches off of the bottom of a leg of a pair of jeans, the extra inch to allow for seam allowance. I realized that the fabric was very long. I laid the cut fabric on my lap and realized that if a cat were to wear a jacket that was that long, it would probably not make a very good lap cat. Or it would be mad at its humans for putting it in a thing that interferes with the glory of its beautiful tail and would start destroying anything it could, provided it could get over the disdain of moving in such a monstrosity. So, I cut the giant piece of fabric into two, more manageable pieces so I could make two jackets instead of one. Then I decided which side I wanted to be the front and I cut it straight down the middle. Then I guessed on where might be the best place for the front legs and cut out the sleeves. Then I cut out four collar pieces, using the tops of the jackets as a guide. 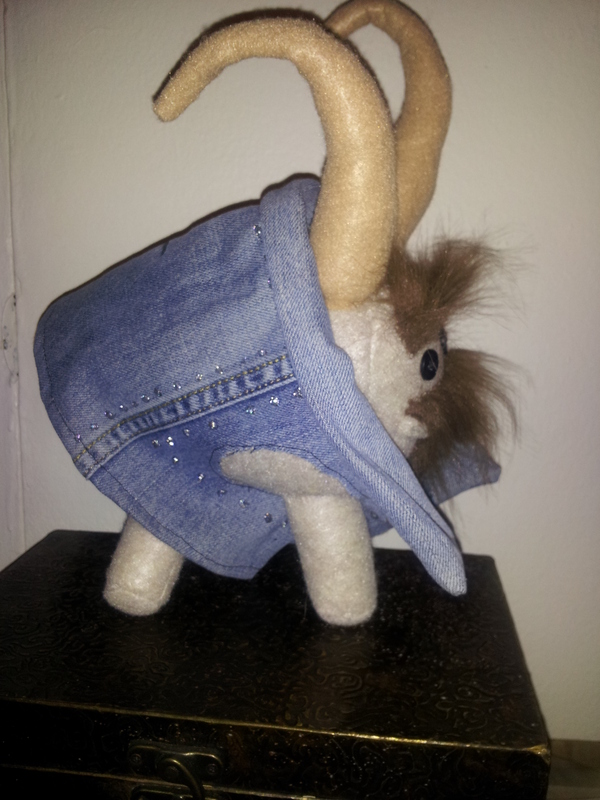 I tried to make sure that I included the seam allowance, but I made the one too short. Then I sewed everything up. I did a straight stitch on the sleeves to help maintain the shape and to make sure that they will only unravel to a certain point, and I sewed the front of the jacket to create a clean edge and to prevent unraveling. I sewed the two collar pieces together and attached them to the jacket, for each jacket. For the jacket that I made the collar too short on, I folded the front of the jacket in and hand sewed it down to make everything fit. Then I started the decoration process. I elected to not use actual studs on these jackets for two reasons. One, I do not know if the cat who may one day wear this will decide to try to chew on the studs. Two, the studs that I was able to find that were not iron on, were $10 for a small box. I think there may be 90 or so studs in the box, but they are of a mixed variety and there is no guarantee that there would be enough of the same kind to complete one jacket. Plus, I am poor and did not want to spend that much money on a thing for a test prototype. Once I perfect the pattern, then I can justify the expense. The first patch shows the paint pen after repeated coats were added. It shows up better in this picture than it does in person. The middle one is what the fabric marker looks like. The final one is me practicing with the fabric paint. I painted a star because I was tired of doing anarchy symbols. 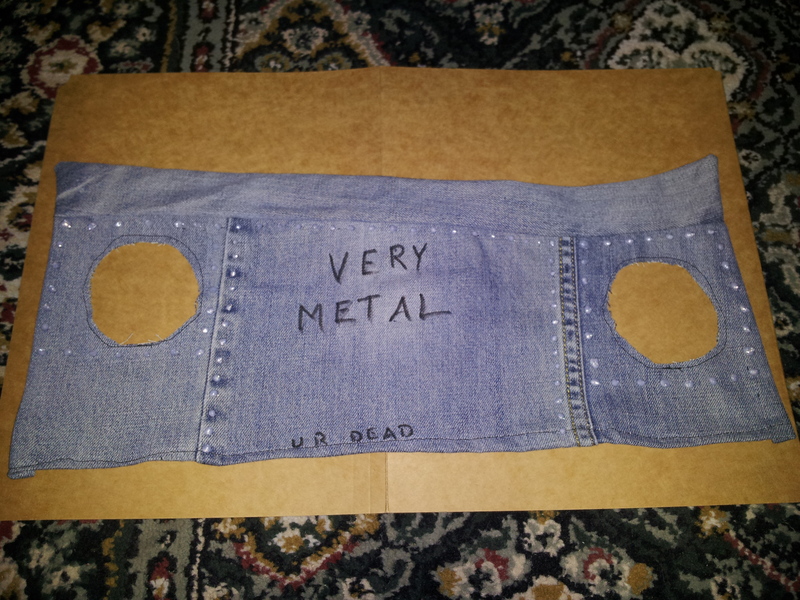 Bonus: I now have three denim patches for future projects. 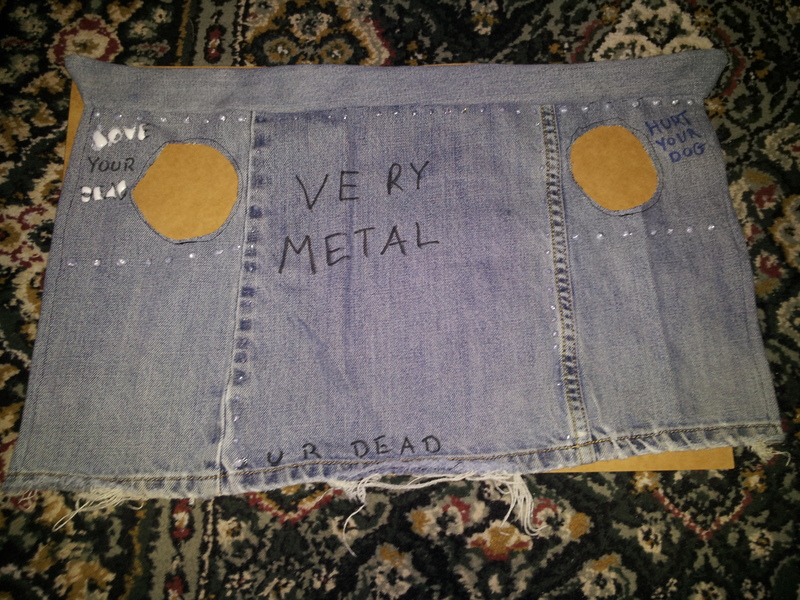 There was some conflict in what Vyvyan’s jacket said. The reference picture that I was using said “Love Your Dead,” while the instructable shows his jacket saying “Love You Dead.” I feel that if I had watched the show I would know which one was correct. I’m mostly ok with my choice and too lazy to look up screenshots again. Of course, if I really wanted to make a screen accurate jacket, I would have included front pockets and chains on the back. Anyway, here are the finished products, as they lay drying. Notice, the one that I made the collar too short on does not have enough room for the words on the front. Should the day come where I figure out the measurements to make a kitty coat, I will make sure that the jacket is more square and less skewed. However, for these I will say that it is entirely intentional. It was surely not laziness on my part. It was definitely an attempt at making the jacket as punk as possible. Right angles are for the man. Don’t follow the rules that society laid down for you. Blaze your own path! And such. This is the shorter one. This is the longer one. I’m still worried that it is too long and that it has too much fabric in the front. I’m not sure that an animal that wears this will be able to move easily. This is what the little one looks like on a space buffalo. I’m hoping that it will fit an actual cat better, but it gives an idea of how it will look.